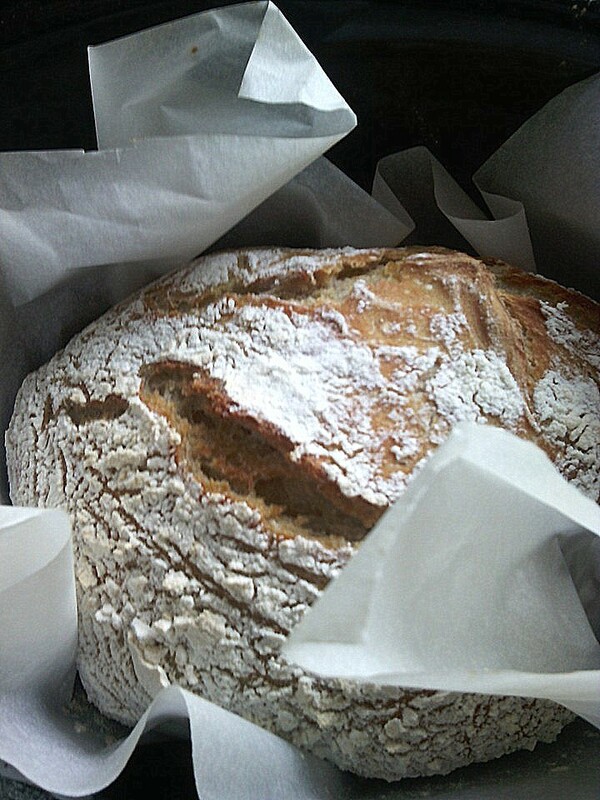 Would you like to make gorgeous gluten free Artisan bread? Today I'm going to show you how! We all know that as gluten-free bakers we can't just whip up a classic recipe easily. We need to use a gluten-free formula that will perform correctly, but we can learn from the ancient techniques, and with the right combination of whole flours, starches and binders, make a bread that is very close and delicious. I've been long distance baking with a friend in England who bakes with regular flour. I was inspired and a bit jealous after seeing her bread. I was determined to make a gluten-free artisan boule like she did and it was fun stepping up to the challenge. So I put on my thinking cap and used what I've learned over the years baking bread. First of all, the classic recipe is all-purpose flour, salt, yeast, and water. I knew I needed to give the gluten-free bread structure to replicate the lack of gluten, so I used buckwheat and added some eggs. I liked the flavor of the buckwheat, but one of my testers said she wasn't fond of it. So the next time I made it, I used part buckwheat and part sorghum. My other tester loved it and said the dough was great to work with! My first boule rose beautifully, had a perfect thin crust, a fair amount of holes and lovely crumb but after a day it was dry. On a suggestion from another friend, I added the pectin and it made a huge difference in retaining the moisture. I've made the bread three times now. The first time, I used a mixer for the dough. The second time, I tried the stir in the bowl method, but that loaf was flatter, so I think the bread needs the mixer for the aeration and to achieve more holes. Also, the no-knead method is a wetter dough. The wetter gluten-full dough goes through two or more rises and the gluten develops. I know that gluten-free dough can't do that so I made mine a bit drier so it was easier to handle. After beating in the mixer, my dough was very thick and hard to scrape out of the bowl. I was able to scrape it out in a lump onto floured parchment, pressed it gently into a round and then I turned it over to coat both sides in flour. I gently pulled the sides and tucked them under the ball to achieve a smooth boule shape. Then I turned on my oven for a minute and turned it off. I left the boule on the parchment, brushed it with some olive oil, slashed it with a sharp knife, sprinkled it with rice flour and set it in the pot and put it in the slightly prewarmed oven to rise. I also leave the light on. Let it rise until doubled, put the lid on and leave it in the oven. Turn the oven on to 400 degrees F. I've been reading Tartine Bread and other recipes like Mark Bittman's no-knead method but I remembered that years ago I tried the hot oven method and my bread turned out like a brick. That could have been my inexperience with the flours, but I decided to try a gentler approach and used a cold oven technique instead and it worked great. Bake covered for 20-25 minutes. Then remove the lid and bake for appx 30 minutes more. Take it out to check the color and test the temperature. I like mine to reach 205-208 degrees F. If you don't have a thermometer, test by thumping the bottom. It should sound hollow. Let it cool on a rack before slicing if you have more will power than I do! Imagine the wonderful dishes you could make with this bread. Cut off the top and dig out the inside for a fantastic bread bowl. Fill with dips or thick soups. Yum! Happy Bread Baking! Please come back and share your changes and results. Thanks! When baking bread, everything needs to warm to room temp. You can take the flours out of the fridge ahead of time to warm to room temp or use this easy tip: Turn the oven on for a minute and then shut it off. Place the bowl of flour mixture (except the yeast) in the oven for a few minutes to warm up the flours. Measure out all of the dry ingredients (except the yeast) into a large bowl. Whisk to combine. Put the yeast, 1/2 cup warm water, and honey in a small separate bowl to proof and bubble. In another small bowl, whisk the room temp eggs and oil. In the large bowl of a stand mixer, add the flour mix, yeast mixture, and egg mixture. Using a dough hook, run on low to incorporate. The dough should look like thick sticky cake batter at first. Turn up to medium high and beat for three to five minutes, adding 1/4 cup additional warm water as needed until it becomes smooth and much thicker. Generously flour a large piece of parchment paper with several tablespoons of rice flour or buckwheat. With a large spatula, scrape the dough out of the bowl and onto the parchment. It should be hard to scrape it out of the bowl and still sticky. Gather the dough and turn it over in the flour. Now, that it's not as sticky, form it into a smooth ball by stretching the edges and tucking them underneath. No kneading is required! If you have a lot of flour still on the parchment like I did, pick up the ball gently, tap the flour into a bowl and return the ball to the parchment. Pick up the parchment and ball, place it in a cast iron dutch oven (see my new one below) or crockpot liner that has a lid that can withstand high oven temps. With a sharp knife make shallow cuts. Brush the dough with olive oil and dust with rice flour. Let rise in a warm location for 35-40 minutes or until doubled. I turn on my oven for a minute and turn it off. You can cover the pot with plastic wrap but I've never bothered. If you do, remove before baking! Once risen, leave the pot in the oven, put the lid on and turn the heat on. Bake at 400 degrees F. for 20-25 minutes. Remove lid to brown and finish for 30-35 minutes or until it reaches an internal temperature of 205 degrees F.
Remove from oven, carefully lift out the parchment and cool bread on a rack. 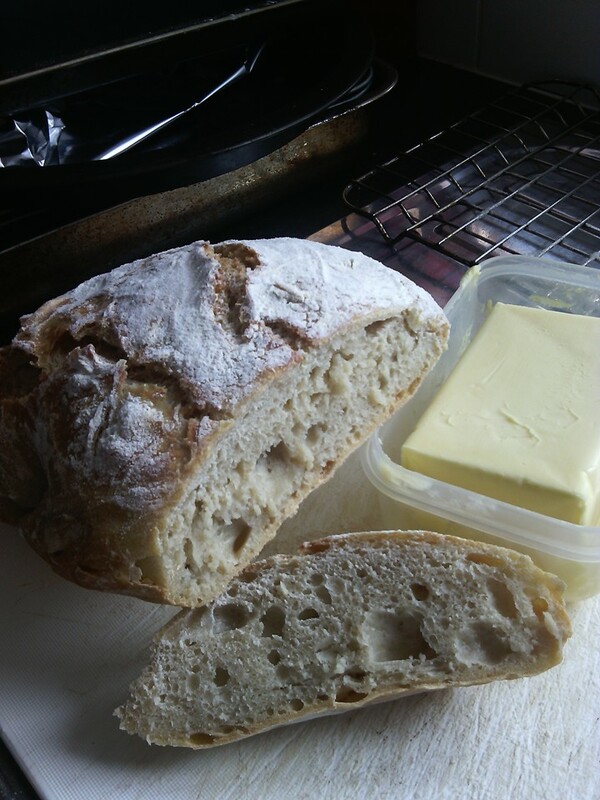 I'm also working on a gluten-free sourdough version with no gums that you don't want to miss, so stay tuned! And here's my dear friend Mauveen Stone's Artisan bread for those of you who don't need gluten-free. 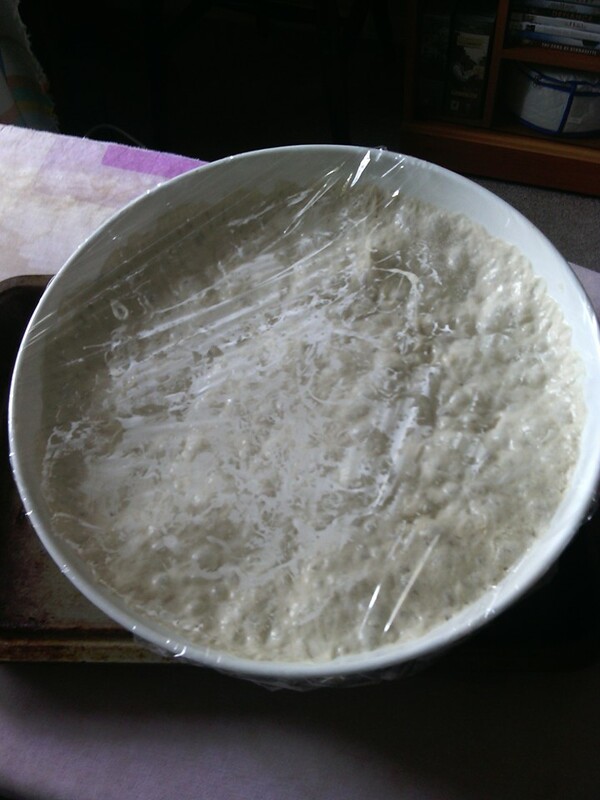 Her dough is much wetter than mine and sat to rise for many hours. She did get some lovely holes, didn't she? And a nice brown crust. I'm sure her bread is delicious. Put the flour, salt, yeast into mixing bowl and stir it around, mixing it well. Then add the warm water and combine it stirring with a wooden spoon. Cover with plastic film and let sit on the counter or cupboard for 20 hours. It should rise and have bubbles formed on top. Turn dough onto a well-floured board and just fold it over a few times. Round it off and put it on parchment paper. Cover with film and rest for 30 mins. In the meantime, turn on the oven to 190C/450F. and put the inside liner of the slow cooker into warm up. Cut across the top of the dough and carefully transfer dough and paper to the hot slow cooker pan. Cover the top with tinfoil and into the oven. Place a small bowl of warm water on the floor of the oven and cook for 30 mins. Remove tin foil and bake for 15 minutes more or until golden brown and tapped bottom of bread sounds hollow. On rising: Mauveen set her dough in her sunroom for 20 hours. On yeast: I used Allinson, Easy Bake Yeast, it is for no kneading bread and is made by the flour makers Allinson, who have been millers for over 100 years and is well known. I am waiting to hear from an organic farm and miller who stone grinds their flour and I have asked them to recommend a good strong unbleached bread flour and any tips they can give me. Up in Northumberland they also run baking classes but too far away for me to go. That loaf looks beyond incredible, Ali! I love that you shared the different methods you tried and what worked for you. I've heard some other friends say that pectin is key to successful gluten-free baking and they use it for even gluten-free flour mix. Thanks Shirley, wish I could bring you a loaf! That is simply gorgeous bread. I'm super impressed! This bread is so beautiful! Love that butter getting ready to be slathered on a slice. Yum! This bread is a dream come true for me! I've missed boule since becoming gluten intolerant, but this is awesome!!! Thanks Lauren! I'm so glad! I look forward to hearing how it turns out for you. It's beautiful, Ali! Thank you so much for stopping by Savoring Saturdays and sharing it with us! Your welcome Raia, I love popping over to visit and share with you guys. Hugs! This looks amazing! My son is sensitive to eggs. Do you think I could use flax eggs instead? I would suggest either #2 or #4. You will need to reduce/delete my additional 1/4 cup water/liquid recommendation and if you use #4, I would use the pectin or gelatin needed for the egg conversion but delete the 1 teaspoon fruit pectin in the recipe. I would love to hear your results and if you need more help you can find me on FB too. Have a great day and good luck!